When at Joe Saglimbeni’s wine shop … drink as the Greeks do? 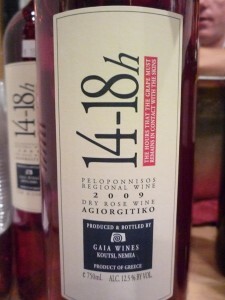 Last week I had the ‘wine’derful opportunity to attend a Greek wine tasting at Joe Saglimbeni’s wine shop. 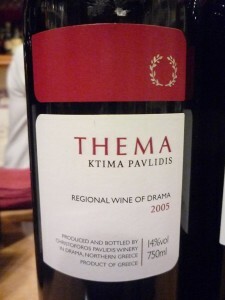 I have had the opportunity to taste Greek wines before, but I am by no means an expert. So, when Joe Saglimbeni said he was hosting a Greek wine tasting last Tuesday, you better believe I got my little spanakopita over there to discover and ultimately enjoy these hard-to-find wines. So if you are one of the 99.7% people out there who don’t know your Xynomavro from your Agiorgitiko, then this post is for you! Before I start spouting off greek grape varietals that are harder than a national spelling bee word to pronounce, let’s go over a little Greek Wine 101. 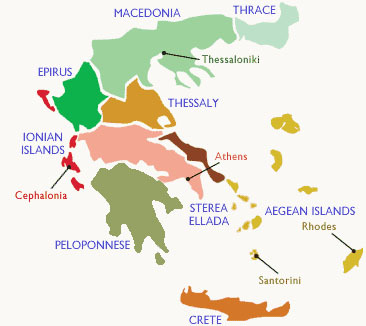 Greece is one of the oldest wine-producing regions in the world, dating back about 6,500 years ago! Evidence also suggests that Greece is home to the second oldest known grape wine remnants in the world, number one being Iran with the discovery of a residue-covered wine jug dating back a bit earlier than the crushed grape skins and grape seeds found in Greece. The ancient Greeks are responsible for introducing many of the grape varietals and early winemaking techniques to Italy, Southern France,and Spain. And there you have it, a lil Greek Wine 101. If you are wanting to know more and perhaps even add a little visual flare to your new Greek wine knowledge, check out this neat YouTube video that introduces their series on New Wines of Greece. Their YouTube channel had loads of Greek wine videos to take you on a virtual Greek wine trip :) Take some time and check it out. Now on to the Greek wines I tasted at Joe’s last week. Wine # 4 was the 2009 Domaine Spiropoulos made from the Moschofilero grape from the Mantinia area. 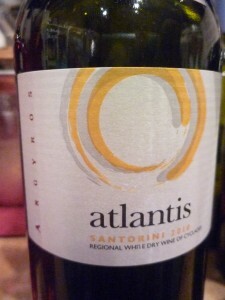 This white wine was light and had a crisp acidity with citrus and lemon blossom aromas. The back label said it smelled like bergamot … had no idea what this was, so I looked it up, here is the link to what it is … crazy huh? Did you know what a bergamot is? Learn something new every day huh? Now you can go to your next wine tasting and use that as an aroma you smell … be vinously obnoxious … you know you want to, lol. 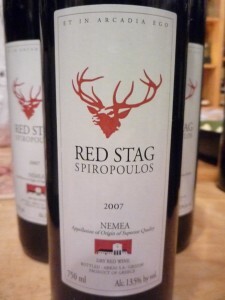 Wine # 5 was the 2007 Red Stag Spiropoulos made from the Agiorghitiko grape from the Nemea region. This wine had aromas of ripe red fruits, spices, wood and something like tea leaves. Again, certain aromas that I couldn’t quite put my nose on … must travel to Greece and learn what all these foreign smells are! 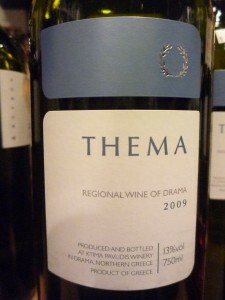 Wine #6 was the 2005 Thema Red made from the Syrah and Agiorghitiko grapes from the Drama region. (I am loving this name, lol. Must remember to pair this wine with a good Drama movie! lol) This wine had notes of chocolate covered red fruits,my dad even picked up on some grilled pepper aromas too, pretty cool huh? :) This was a delicious wine, I loved it! The last wine was the 2008 Uranos made from the Xynomavro grape from the Naoussa region in Macedonia. The name of the wine was pretty hilarious to my wine tasting group … so what if that means we are immature … how can you not laugh when the name Uranos is sooooo close to … Uranus, hahaha :) In any case, funny name, seriously delicious wine! The aromas were of cherries, plums, spice cake, and even hints of green peppercorn. Yumm! I hope you enjoyed this neat discovery of Greek wines :) If you are wanting to taste these for yourself, do head over to Joe Saglimbeni’s wine shop or your local watering hole and ask if they have any of these or other Greek wines to try. I think you will be awesomely surprised! BTW, if you want to check out a fabulous wine blog devoted only to Greek wines and learn soooo much more about Greek wines and the wine industry there, please visit my fellow wine blogger Markus Stolz on his Greek wine blog www.elloinos.com – you will love it! He even appeared on an episode of Gary Vaynerchuk’s Wine Library TV!! Check it out here. Previous Previous post: Social Wine Education #1 – Bastille Day Bash! !